Porridge is one of those dishes that always makes me feel great. 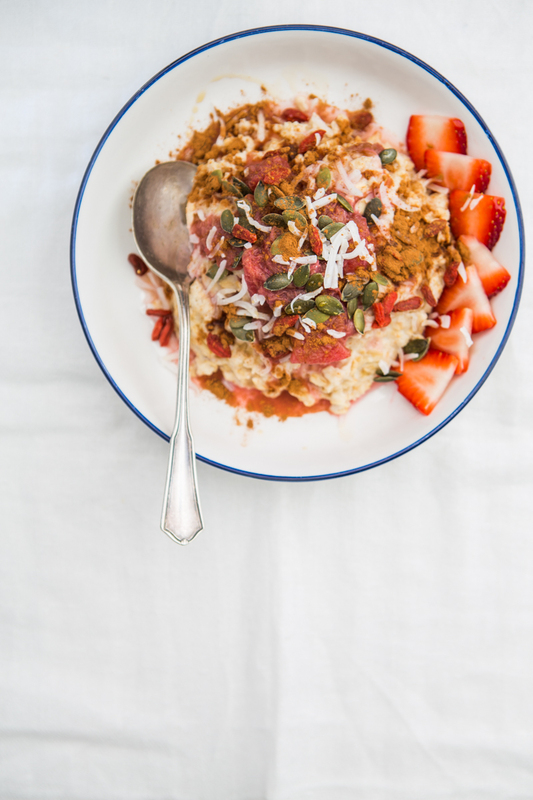 The thought of consuming a nurturing bowl of creamy oats is instantly warming and drool-worthy! Growing up within a European family, the only way to cook porridge was on the stove and with milk. 20-something years later and nothing has changed. OK well maybe some things… For one, I am the most surprised to discover that my nostalgic childhood recipe is even better with the use of almond milk! I have always been a plain-jane with my porridge topping, preferring the nutty, chewy taste and texture, allowing the oats to shine through with maybe a hint of cinnamon and a little fresh fruit to complement. 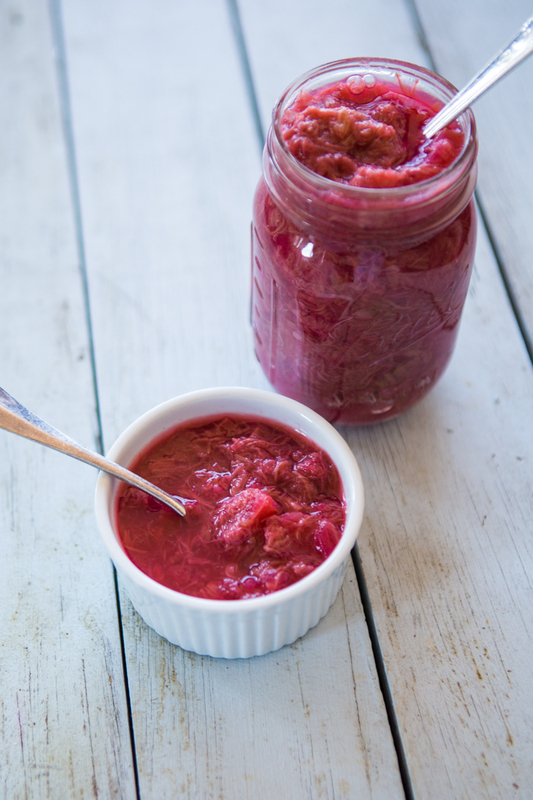 Although this combination is still fantastic, last year I started creating unsweetened stewed rhubarb and adding it to my porridge (read: everything and more on that later) as an-anytime treat. This combination changed me forever. 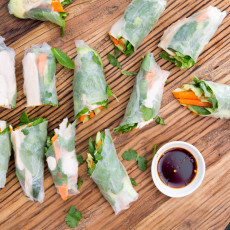 Its’ ease, deliciousness, simplicity and nourishment are too good not to share. Oats are my kind of superfood. On the science front they are cholesterol lowering, rich in Vitamin E and dietary fibre (more than any other grain) and contain manganese, selenium, phosphorus, magnesium and zinc. 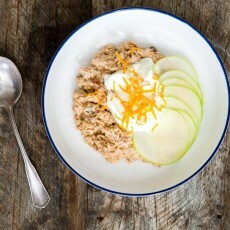 For me, one of the winning points about oats is their effect on blood sugar and insulin. As someone with genetic insulin resistance this is a super crucial element to the food that I consume and for anyone looking to prevent diabetes and a whole host of issues! Just like the ads tell us, it is the beta-glucan levels in oats that slow the rise in blood sugar levels following a meal, ensuring that changes in blood sugar levels are avoided. The other bonus is that I can eat a bowl of porridge and even with my activity levels, be all set and satisfied for 5 hours. There is little else that can do this for me and I feel incredible when I have porridge for breakfast! This point is always very interesting to anyone looking to lose a little weight as oats are so satisfying, even in smaller amounts and therefore weight management gets a helping hand. 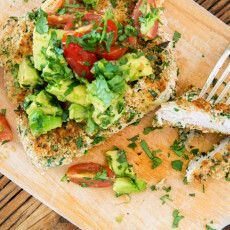 So you eat something you love and both your insulin and weight can be controlled – amazing! Told you it was a superfood. The oats/gluten-free debate rages on… Oats as a grain, are gluten-free however the problem lies in their general farming, harvesting and processing. It is at these stages that cross-contamination from other grains (with gluten) can very easily occur and in Australia this is common. There are brands like Bob’s Red Mill for instance, who offer a gluten-free oat product and generally speaking steel cut oats (the least processed version of oats) are a much safer choice for anyone steering clear of gluten though coeliacs are encouraged to stay away from oats altogether. On the rhubarb front, this recipe may even outshine the porridge itself! It couldn’t be easier. It also couldn’t be more delicious. This week my local market was selling 2 bunches for $4 and I have found incredibly varied uses for the stewed rhubarb all week long. The ratio of rhubarb to apple is completely variable, just leave the other ingredients the same. I personally feel that a ratio of 2:1.5 rhubarb to apple is spot on though we all have different tastes. Increase or decrease the apple ratio as you prefer and by all means if you feel you want a sweeter result, add a dash of raw honey. 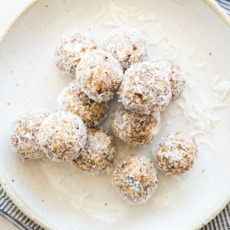 I would recommend making this recipe and seeing what you think, it is surprisingly sweet as it is. Will keep well when stored in an airtight container in the fridge for up to 6 days. So now onto the main attraction – this porridge. Whether you choose to make and add the rhubarb or not, this porridge has two ingredients and takes about 5 minutes. Seriously. That’s it. Use the beautiful images in this post to inspire some additional topping suggestions. Even if you don’t have the rhubarb on hand, maybe try out any combination of crushed walnuts, pepitas, sunflower seeds, coconut flakes, mulberries, goji berries, a sprinkling of cinnamon and perhaps a drizzle of maple syrup or raw honey. Fresh fruit is always a winner as well, be inventive and discover new combos each time – there is no wrong answer. 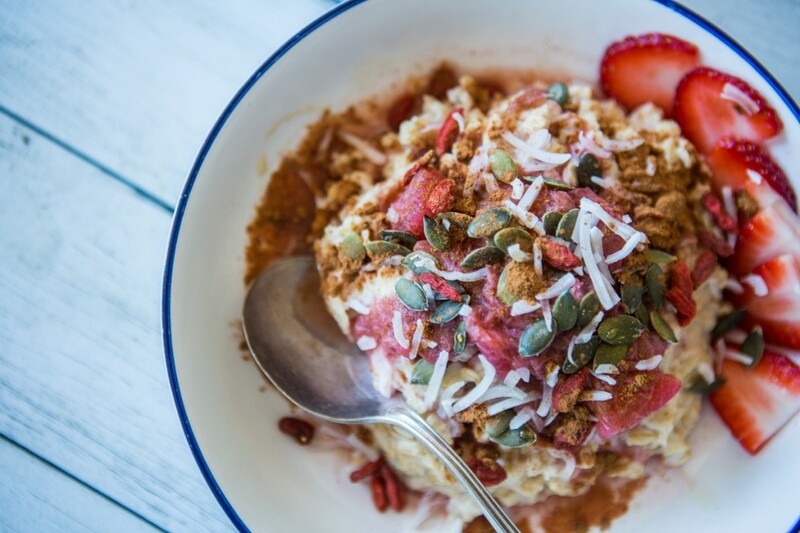 If this bowl of heaven has you excited to sample then share it with someone else and let them kick off their weekend with Dreamy, Creamy Porridge too! 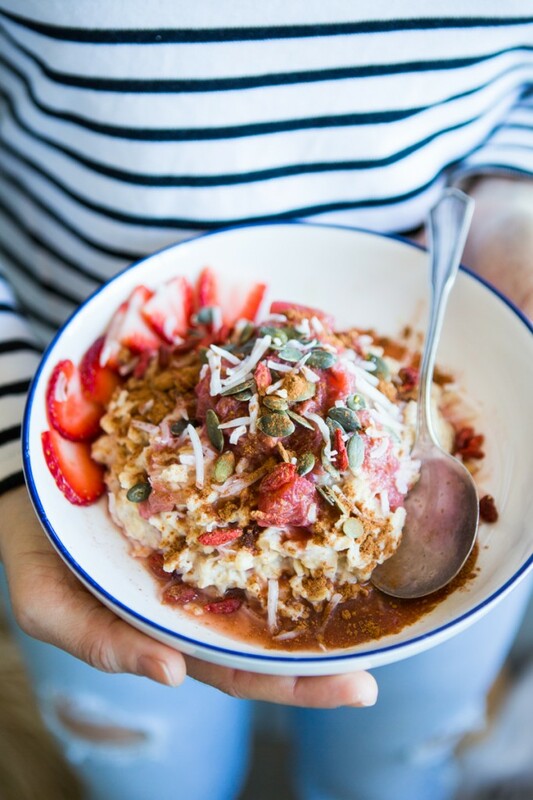 17 Responses to "Dreamy Creamy Porridge & Stewed Rhubarb"
This rhubarb porridge looks amazing but I was wondering why you have said that it is gluten free when you have used rolled oats. According to the Coeliac Society, oats (except for steel cut) are not considered gluten free? Thank you for your message and absolutely spot on information! Oats as a grain, are gluten-free however the problem lies in their general farming, harvesting and processing. It is at these stages that cross-contamination from other grains (with gluten) can very easily occur. There are brands like Bob’s Red Mill for instance, who offer a gluten-free oat product and yes as you have said, generally speaking steel cut oats (the least processed version of oats) are a much safer choice for anyone steering clear of gluten. Thanks again for the question! I love your food philosophy and wish you every success on your crusade to educate as many people as possible about considered choices and healthy eating. I appreciate that Jennie and thank you for such a thoughtful message. I love rhubarb and porridge..one cup of uncooked porridge would make a huge bowlful! Can I really eat that much haha!! Such a perfect combination aren’t they Paula? 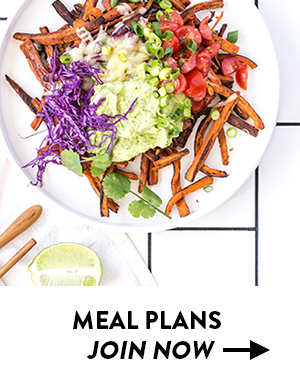 I often will eat that much though I’ve edited the recipe, thanks for the heads up! This porridge && stewed rhubarb is THE best breakfast. It is my go to brekky every morning && would eat it for breakfast lunch & dinner if I could . My pleasure Jaimie and I’m thrilled that you love it so much! I agree… yum and so satisfying right? I’m ready excited to try this recipe! I’ve recently been put on a low fodmap diet for ibs, is there something I can substitute the apple for to make it low fodmap? Fabulous Louise – you’ll love it! Absolutely – substitute the apples for a punnet of strawberries (lower fructose and FODMAP friendly). Tastes amazing Nadia! Thanks for sharing the recipe ?